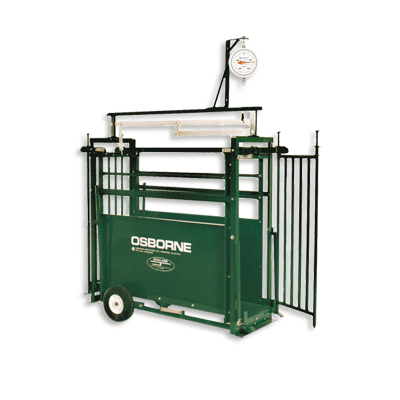 Whether you are weighing market hogs to capture packer premiums or weighing show pigs, goats, or lambs, the Osborne ACCU-ARM Portable Scale offers the most “rock solid” portable weighing system available. The solid, animal-friendly scale uses precision levers to reduce sway and bounce and is completely cable free! With Osborne, the entire weighing operation is more efficient and less stressful for both you and your livestock! This scale features standard side panels, side-opening gates, a wheel kit for easy transportation, a mechanical weighing meter, and damper cylinder kit. The scale platform is 14 in. (36 cm) wide and the scale weighs animals up to 500 lbs. (227 kg). For customized livestock scales, please click here. * Mechanical dial is included with this scale.